This circuit is used to turn on and off appliances remotely. It consists of two parts: a transmitter and receiver. Transmitter contains an oscillator with integrated circuit 555 which produces a signal with a frequency of about 36 to 38kHz (can be modified by changing capacitor C1). The output of the oscillator drives the transistor. The transistor is switching the infrared transmitting IR LED. It may be, for example type TSAL6100 (first from the left side in the photo below). 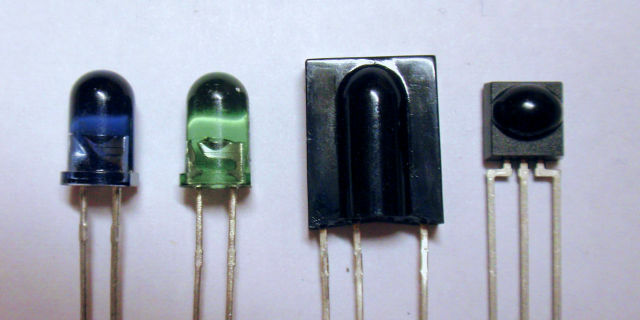 Various transmitting LEDs vary in luminous intensity (for infrared diodes it is actually radiant intensity measured in mW / sr) and its beam angle. With proper diode the range of several tens of meters can be obtained. The transmitter can be powered by a miniature 12-volt battery or normal 9V battery. Receiver The input circuit contains TSOP1736 (or TSOP1738, TSOP1136, TSOP4838, TSOP31236, SFH5110-36, SFH5110-38, PL-IRM0101-3 etc. ), which is sensitive infrared receiving diode with integrated demodulator, shaping circuit and TTL output. In normal condition there's positive output level (log 1). When receiving a signal from the transmitter, negative pulse (logical 0) appers at the output. This discharges 47u capacitor and turns off the first transistor (capacitor provides a delay, necessary for interference immunity). This flips the 7490 circuit and the relay turns on / off. Receiving is indicated by flashing LED. Capacitor and resistor labeled in the diagram by asterisk guarantee that after the power is applied, relay will be switched off. If you need the relay to be on by default, connect those two parts to pins 6 and 7 and pins 2 and 3 are then connected to GND. The receiver is powered from the 12V mains adapter (voltage may not be stabilized) and consumption when relay is off is about 15-20 mA. The relay must be rated for load that will be connected to it. If you use circuit to switch safe voltage and powering it from appropriate mains adapter, it does not require any special care and the construction is then suitable for beginners. If you need to control multiple appliances, you may be interested in Simple 4-channel remote control. The circuit can also be used to switch the mains voltage, but such a construction can only be recommended to those skilled in the principles of working with it. For your possible injury I do not take any responsibility. Everything you do at your own risk. Infrared ON-OFF remote control schematic - transmitter. Infrared ON-OFF remote control schematic - receiver. Example of 5 mm infra LEDs (left) and receiving diodes with internal receiving circuitry (right).